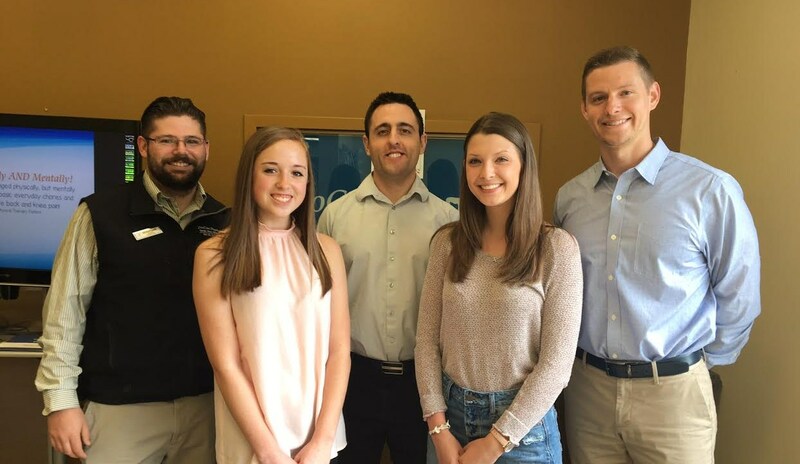 Working in partnership with Tunkhannock High School students to identify potential career paths are (from left) ProCare Director Dr. Michael Lynch, Ashleigh Miroslaw (THS), Dr. Bo Marcy, Sydney Walters (THS), and Dr. Tim Kerestes. ProCare Physical Therapy works closely with Tunkhannock Area High School to provide students with observation hours at their West Street clinic. TAHS program facilitator, John Shaffer, applauds the measures ProCare and its doctors are willing to go to ensure students make educated career and college choices. In this unpaid internship students are assigned to local businesses to experience a “real world” work environment. Sydney Walters, a graduating senior, states, “Throughout the first semester of this school year, I had the opportunity through Tunkhannock Area High School to participate in the internship program at ProCare Physical in Tunkhannock. My future plans have always been to pursue a career as a physical therapist, but upon entering the program, I was still a little hesitant if that’s what I wanted to spend the rest of my life doing. Because I am not certified, I was unable to assist in hands-on therapy, however the experience of observing the physical therapists at work and being immersed in the atmosphere of the clinic, confirmed that this career was meant for me. Ashleigh Miroslaw, a junior, also interned at ProCare, throughout the second semester and said, “It was such a great learning experience and the knowledge I gained from it is immense.” For people who are unsure of their career path, an internship is definitely the way to go.” Ms. Walters has been accepted to attend the University Scranton this fall in pre-Physical Therapy studies to ultimately pursue a doctorate in Physical Therapy. Shaffer encourages more students to invest their time in similar work experiences with the end goal of making “career choice rather than career chance” decisions.